A full computer lab in one affordable bundle! 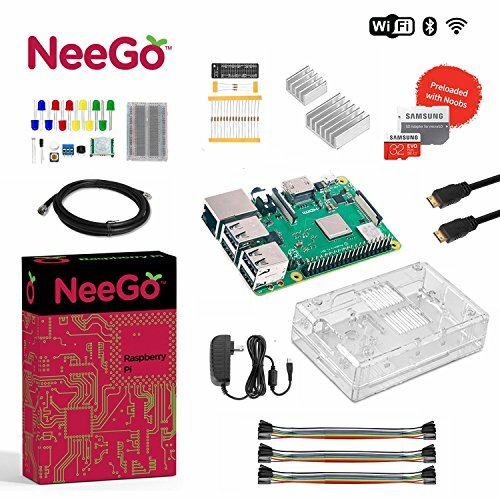 Introduce inquisitive minds to the wondrous world of computing with the Ultimate NeeGo Bundle, an all-in-one computer-building kit featuring everything kids and adults need to start programming their way to greatness. Our latest pack includes the 2018 Raspberry Pi 3 B+ barebones motherboard, a preloaded 32GB memory card with NOOBS operating system, miscellaneous heatsinks, wires, cables, LEDs and switches, a 6-foot power cable and a host of other specially designed parts and safety components. Children channel their inner Gates and Jobs while watching their circuitry in action through the clear protective enclosure with access to all major ports. Meanwhile, the bundle's 6-foot HDMI cable hooks up to any screen so they can surf the web, play games, practice code and perform other educational computing tasks. Best of all, most parts are universal, working perfectly with your other Raspberry Pi supplies. So no more bulky boards and pricy piecemeal equipment. Bring home a NeeGo Bundle, and unleash the ultimate in STEM inspiration! An educational gift for home, school and play!